James R. Farr is the Germaine Seelye Oesterle Professor of History. He received his Ph.D. from Northwestern University in 1983. He teaches European history courses in the early modern period, as well as courses with a methodological and theoretical emphasis. 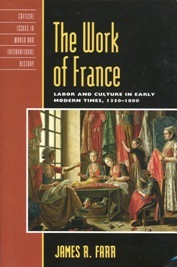 The Work of France: Labor and Culture in Early Modern Times. Rowman and Littlefield, 2008; A Tale of Two Murders: Passion and Power in Seventeenth-Century France. Duke University Press, 2005;Western Civilization II, 1648 – Present. The College Network, 2003; Artisans in Europe 1300-1914. Cambridge University Press, 2000; Authority and Sexuality in Early Modern Burgundy, 1550-1730. Oxford University Press, 1995; and Hands of Honor: Artisans and their World in Dijon, 1550-1650. Cornell University Press, 1988). Professor Farr is a recipient of the following fellowships: John Simon Guggenheim Fellowship, 1998-99; Shelby Cullom Davis Center for Historical Studies Fellowship, Princeton University, 1994-95; and The American Council of Learned Societies Fellowship, 1994-95.